Frederic Church was America’s most important painter during the middle years of the 19th century. While famous for his scenes of the Arctic, South America, and the Near East, his landscapes of Maine were central to his career for over four decades. This exhibition explored first his early mastery of the conventions of art history, the expressions of national history during his maturity, and finally the poignant reflections of personal history in his later years. Guest curated by John Wilmerding, the Christopher Binyon Sarofim Professor of American art, emeritus, at Princeton University. Maine Sublime included 10 oil and 13 pencil sketches from the Olana collection that celebrate the glories of Maine scenery. Many were on public view for the first time, including the vibrant plein-air sketch Wood Interior near Mount Katahdin, c. 1877. Loans of 4 important works from the Portland Museum of Art, the National Gallery of Art, Washington, DC and private collections augmented the sketches from Olana. The early and spectacular Newport Mountain from Mount Desert, 1851 from the National Gallery of Art depicting nature’s more awesome character in the turbulent surf and looming mountain were displayed alongside the related sketch, also from the National Gallery of Art, Fog off Mount Desert, 1850. The artist first journeyed to Maine in the summer of 1850 spending six weeks on Mount Desert exploring the coast, its rocky Islands, and peaceful harbors. 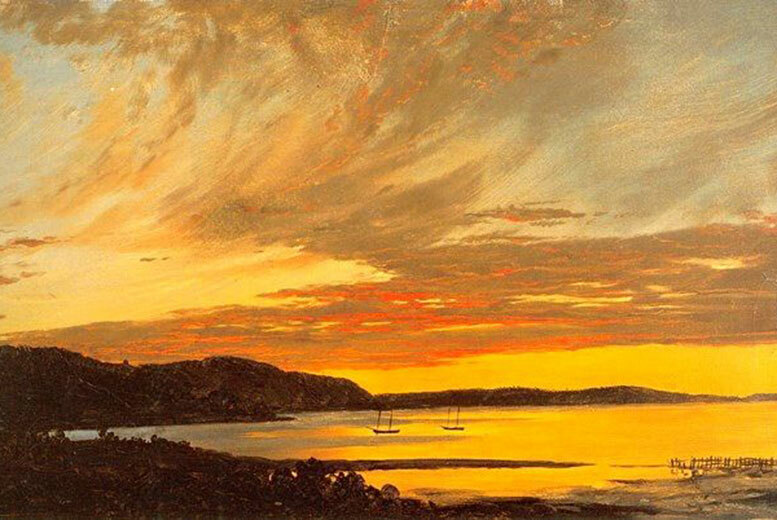 He sketched the scenery which he described as “magnificent both land and seaward,” capturing the splendid sky effects in Sunset Bar Harbor, 1854. In 1852 he trekked inland focusing on the area of Mount Katahdin. Over the next decades Church continued to visit Maine capturing sensational sunsets, robust crashing waves, impressive peaks, and an abundance of wilderness. Wilmerding’s analysis of the paintings inspired by Maine reveals Church as both a public and private artist. “The work done in Maine during the 1850s and early 1860s, primarily at Mount Desert, embodied sentiments of increasing national strife, in symbolic and suggestive ways, while the career of the later 1860s and 1870s was devoted more to his personal time in inland Maine around Mount Katahdin,” explains Wilmerding. Featured in the exhibition was Twilight, A Sketch, 1858 the study for Church’s great masterpiece Twilight in the Wilderness, 1860 (Cleveland Museum of Art), which reflects the tensions surrounding the impending Civil War. Mount Katahdin from Millinocket Camp, 1895 on loan from the Portland Museum was the artist’s last major Maine canvas and a birthday gift to his wife— a work of great personal significance that both enhanced the exhibition and directly related to the artist’s life at Olana. The Maine material presented in the exhibition ranged from finished oil sketches that Church displayed in his home to pencil sketches and cartoons that he stored in portfolios and shared with friends, fellow artists and guests. A delightful pencil rendering of the newly married artist and his wife enjoying the bracing coastal winds on one of their first trips to Maine, gave visitors a glimpse of Church’s witty nature. To read John Wilmerding’s scholarly article click here. A full color exhibition catalog is available at the Olana Museum Shop. Olana organized this traveling exhibition to highlight the Church paintings and sketches of Maine from the Olana Collection. 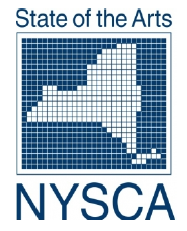 This exhibition is organized by The Olana Partnership and the New York State Office of Parks, Recreation and Historic Preservation. We are particularly grateful to Henry and Sharon Martin for their commitment and dedication to supporting the development of high quality catalogues in conjunction with Olana exhibitions. Support for John Wilmerding’s lectures in conjunction with the exhibition at each venue was provided by CHRISTIE’S. The Trustees and staff of The Olana Partnership wish to recognize the support of Governor Andrew Cuomo; New York State Office of Parks, Recreation and Historic Preservation Commissioner Rose Harvey; Deputy Commissioner for Historic Preservation Ruth Pierpont; Regional Director, Taconic Region Linda Cooper; former Director of the Bureau of Historic Sites John Lovell; Acting Director of the Bureau of Historic Sites Mark Peckham; former Olana Site Manager Linda McLean, and Olana Site Manager Kimberly Flook. Read John Wilmerding’s scholarly article, click here.